If you were a book, your opening sentence would be my first impression of you. It is that type-set handshake, that eye contact, the initial body language of our literary relationship, from which I will decide whether we might become friends. I should warn you, I am exacting when it comes to first impressions. Wittgenstein, as an aside, lays claim to the most wonderful last words. From his death-bed: “Tell them I’ve had a wonderful life.” Lovely. 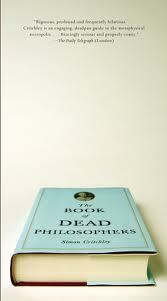 If you’re in the mood for an eminently readable survey of the history of philosophy, I recommend Simon Critchley‘s The Book of Dead Philosophers (2009). It is entertaining, fun (last days of the big thinkers), and when you’re finished, you will have touched all the bases of philosophy. This is a great way to think about every book– taking seriously the author’s very first words to us.